We asked 44 marketers their advice on creating a compelling email marketing newsletter. What we found was super insightful and now we have a few tricks up our sleeve for creating a great newsletter. We are in the midst of redoing our company newsletter, well really starting back up again. We’ve tried launching a newsletter, but it sort of fell flat. And it ended up dropping on our list of priorities. That’s not to say we haven’t had success with email marketing or email blasts. Since everything else we send has done and is doing quite well. We just missed the mark when it came to sending a newsletter. We have decided to reach out to our marketer friends and get their advice. We wanted to see what works for them, and how they have been able to create a compelling newsletter. We had a ton of feedback. So much in fact that we had to split up our data into two articles. We will be covering half of our findings here, and the second half will be in our article on tips and tricks to create engagement and community in an email. We received 44 responses in total for our survey. The survey consisted of 6 short fill-in the blank and multiple choice answers and 2 long-form questions. In this article, we will cover more of the qualitative information we found. Of all the respondents 39 provided detail on the tone of their message for their newsletter. Nearly 3 times as many marketers are using a conversational tone rather than a business tone in their newsletters. Percentages are based on the 39 respondents who mentioned what tone they use for their newsletters. In addition, of those that do use a business tone, 85% (10 of the 13) say they intersperse it with a conversational tone. 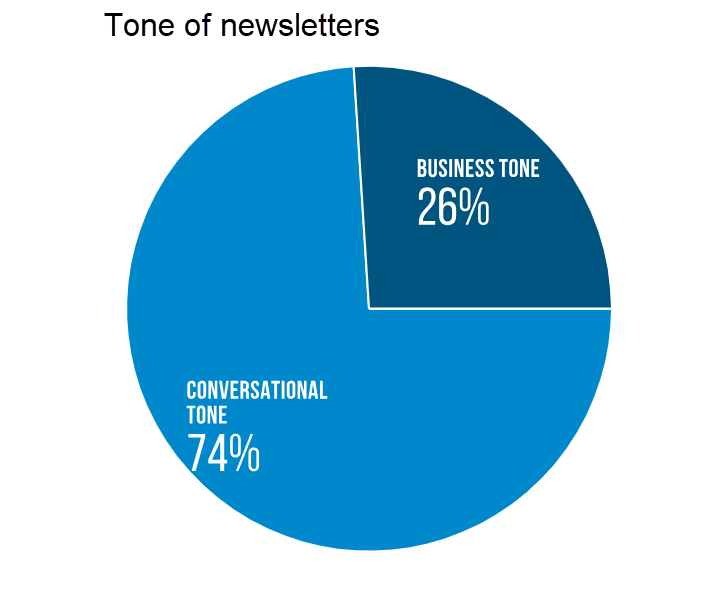 Conversational tone is the expected newsletter tone unless you are in a highly conservative industry. Even then, it’s rare to use solely business tone. Your newsletters’ tone is incredibly important when it comes to readership, and we suggest testing a few different styles to find the tone that works best for your business. We also found there is a preferred day to send. That day happens to be, Tuesday. Most marketers mentioned that they send their newsletters on this day, making it the most popular day to send. 75% of our respondents said that they only send their newsletters on a specific day of the week. While the other 25% doesn’t always schedule their newsletters for a specific day of the week. 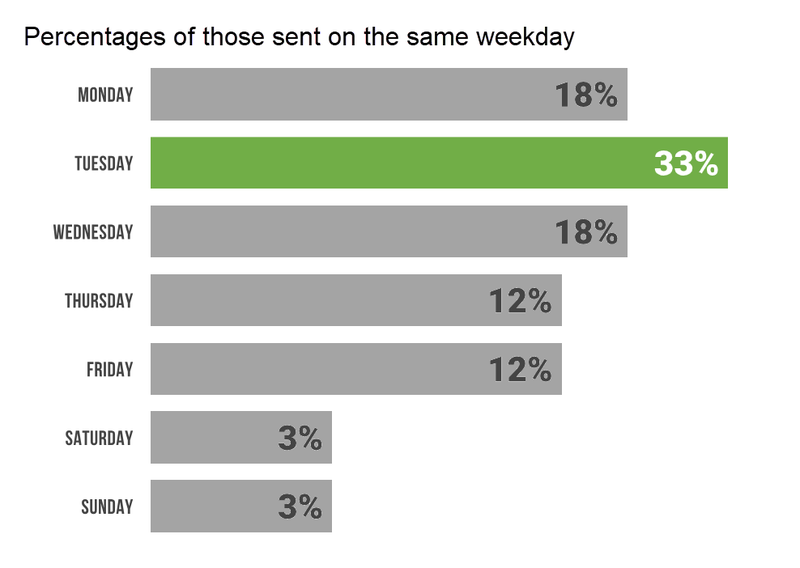 These percentages come from the 75% of respondents who said they send their newsletter on a specific day of the week every time. While a lot of articles and studies have been published saying that Tuesdays get higher open rates than other days, there’s a bit of game theory in play here (see https://en.wikipedia.org/wiki/Game_theory). With nearly twice as many marketers sending their newsletters on Tuesday than any other day, you’ll be up against much more competition in your readers’ inbox. Consider that people have access to their email much more in the mobile age. Takeaway: Buck the trend and try to send on other days of the week. Test and see what works for your newsletter. Bonus: You may also want to check out services like Seventh Sense, which uses your recipient’s behaviors to optimize the send time. Pretty cool! What makes email marketing effective? We’ve heard a variety of processes on creating compelling newsletters and developing an email marketing plan. What we’ve learned is there is no one correct way of doing it. You’ll see that there are actually a few different routes you can take to create the most compelling newsletter for your audience. But in our research, we did find a couple of commonalities. We’ve broken some processes down to their basic elements. Ketan Kapoor from Mettl, brings up a good point, “To create a compelling newsletter, you must know the requirements and challenges of your audience beforehand”. He mentions that “if you try to create a “one size fits all” newsletter; your newsletter might fail from the start”. But what are some ways you can create a compelling newsletter for peak performance? Like all marketing campaigns, an email newsletter needs to be well thought out. Liz Coffman from Riotly Social Media shares 5 steps to make sure your newsletter is powerful. 1. You have to draw your readers in quickly by identifying a challenge. “This could be in the form of a question, a compelling statistic or statement”. 2. Link to beneficial items. “Each newsletter includes a link to a new article designed to solve that particular week’s challenge”. 3. Use something captivating. “In order to ensure click-throughs, include one or two teasers (with visuals) that preview a key piece of information integral to the article itself”. 4. You visuals must have a purpose. “They are placed strategically throughout the newsletter to ensure the reader stays engaged, and they provide visual roadmaps or markers for clickable anchors or links”. 5. Keep the message conversational, but short. “Most people have a fairly short attention span when it comes to reading emails. This is why I craft my newsletters to get to the point quickly”. Liz also mentions that length is important to note. “I also keep my newsletters relatively short because I know a large percentage of readers will be opening my email on their phone”. Sometimes the best way to compel people to read a newsletter is to give them a good reason to read it in the first place. If you are providing helpful information as the sole reason for sending your newsletter, customers will likely be interested in reading. She also suggests to make it simple, “Keep design and copy minimal so that it’s easy to read and would force your subscribers to click and learn more”. IT Tropolis’ Bob Herman, agrees with keeping it simple and informative. He mentions there are two points for creating a compelling newsletter. “1. Short to the point subject lines that are not too salesy and that speak to my readers. 2. Provide helpful information to my readers, in many cases cybersecurity tips to stay safe from cyber attacks”. Sometimes being informative is as easy as sharing relevant industry information. Lauren Petermeyer from 301 Digital Media says “Our newsletter is centered around the digital marketing space, so I try to include relevant information that people can take something from and use it at their job. Also, we try to cover some of the big news stories going on to help keep our readers up to date on things happening in the marketing world”. Nikki Devereux from Pinstripe Marketing mentions that they repurpose and make their newsletter fun by sending their newsletter as a series. She says, “This year we have been running a series in which we compare marketing to aspects of Wonder Woman, and it’s been really fun and people are engaging with the content, so that’s always a good sign”. She also talks about how the information needs to be useful too. “Overall, our general guideline for content is that it has to be useful to our reader – marketing and PR tips, local events, and spotlighting our clients and vendors in fun interview-style pieces”, she says. Bulleted lists make it really easy to see the value in something. “Pull basic business data and put it in with some bullet points, highlight upcoming product changes as well as the outcome of previous changes, highlight one feel-good story from customers/service providers, and include some directional tips on improving customer satisfaction”, says Alan LaFrance from Lawnstarter. Along with bullet points, it’s necessary to create ‘a-ha’ moments. Jx Tan from Momentum Digital explains, “The aim of our newsletter is to engage and educate. Therefore, my team strives to provide a (1) visually engaging end-product and (2) provide “A-Ha” moments for subscribers who read our newsletter. We define “A-Ha” moments as combining data and insight to deliver actionable business value to our subscribers”. He goes on to say, “I will focus on how we curate “A-Ha” moments – throughout the month, we will store fresh industry reports & insightful infographics into a Dropbox folder. Every last Thursday of the month, we will take a look at this folder to see what’s our theme for this month. Next, we will curate a newsletter tapping on 3 to 5 stories that offer a blend of industry insight, data, news, and our own case studies. Sometimes, we will mix in a commercial call-to-action but most of the time, our newsletter is purely educational in nature”. Listen to what your customers want. They are after all the ones who will be reading your newsletter. So if you want to catch their interest, you have to give them what they want. Freelance blogger and cartoonist Luana Spinetti mentions that she relies on her editorial calendar to come up with newsletter ideas. But, that she also uses her readers feedback to stimulate interest. She says “I add content (tips, curated content, special offers, webinars, etc.) that I know my subscribers are interested into because I regularly poll them or because they replied to my past emails and at least some of them have asked for specific types of content”. Shinesty’s Ben Lauderdale, mentions that customer comments also play a big part in tailoring their newsletter as well. Saying that “Everything we write and create has to be irreverent and on brand. We use customer comments, break the fourth wall, create engaging quizzes, and also create infographics to convey why people should buy the product or products we’re writing about”. Sometimes, however, it’s as easy as browsing your social media sites to see what interests your readers. Zach Hendrix from GreenPal mentions, “We monitor the discussion inside of our Facebook group to come up with ideas and problems that we can solve for our users to place our newsletter”. Along with customer feedback, an important aspect to consider is the background of your customers. You may find that you can further categorize readers into groups, like salespeople and marketers. IMP Corporation’s Vincent Scatena suggests using a protocol. Saying, “Changes in newsletter practices can increase efficacy–but rather, those changes and variations themselves should be incorporated in the overall protocol”. He mentions, “For example, a straight product advertising newsletter might appeal to 20% of your subscribership, while 50% respond more favorably to content-driven newsletters. In this instance, it makes sense to calendar out various blast types to cover your entire demographic”. Use templates in your emails that have been tested to work. Content that has had good engagement can take your emails far, but your design can bring it all down. Web Designer and SEO expert Alex Wright says, “Email design is now like web design was 10 years ago. There are dozens of different email clients (programs) and emails can look vastly different on Gmail / Apple Mail / Yahoo / Outlook, and then there are all the mobile versions of these clients”. He goes on to say, “A poorly formatted email will make your company look unprofessional. You cannot just test in the 2-3 email programs you have on your desk. Use a paid service like Litmus or Email On Acid to test your emails. It’s worth the money to not send broken, unprofessional emails”. If something has worked in the past, it might be worth your time to just keep it consistent, every single time. Brandon White who turns ideas into businesses explains, “I have a general template that I use to keep things consistent and so people know what they will find where. Being consistent I have found is key to getting people to engage”. It’s also important to look at what content has already done well for you. As this content will make a great addition to your newsletter. Amber Ooley from Thrive Internet Marketing Agency says, “I pull the top-performing blog posts and other content from the last week based on Google Analytics, website engagement, and social media shares. Then, I’ll craft it all into a consistent email template”. She mentions that they have also turned to a more handcrafted approach with creating their newsletters. Explaining, “It takes a little more time to build an email every week, you have more control over the variables that influence open rate, click rate and ultimately your conversion rate”. Lily Maley Director, Creative & Brand, at Cision explains that “We have dozens of sends that go out daily, and have optimized and tested the lists so that they get the optimum open rate for the list. Our digital marketing team are wizards”. She further explains her contribution as such, “My contribution is in building drag and drop modules with clear typography and calls to action, tactfully interspersed with some of our best award-winning content”. Keeping your newsletter consistent with your niche is key. In fact, most can agree that showcasing top trending industries topics makes for a good newsletter. PayKings’ Jessyka Lee says even though they pull links from their own trending content they spend time finding other trending sources. She explains, “We spend time manually editing it and adding content that speaks to the latest trends and hottest news tips for merchants in industries that we offer solutions for”. The Advisor Coach, James Pollard agrees. He mentions that he looks for events happening all around him. Saying, “ If you’re a marketer, nothing bad happens to you because everything can be used to create a compelling story. Also, it’s important to stay current with events in your industry. If you can be the first to tell people about a particular idea or topic, they will follow you even more”. Sometimes a popular topic might be one that’s highly requested. If this is the case, you have the opportunity to provide readers with valuable content. Devin Stagg from Pupford mentions, “Typically we craft our newsletter around specific topics that we’ve been getting questions about in the recent days or weeks”. He explains, “Sometimes those questions come via chat, email or within our private Facebook community. We try to gather those questions and then provide valuable answers via our own content or other from other places as well”. After you find your trending topic, you can create a buzz from the get-go by naming it in your subject line. Creating interests from the second someone lays eyes on the email, can be the trick to getting them to click. Handyman Connection’s Derek Christian explains, “The most important element is the subject line of the email. We look for a compelling idea that can be communicated in less than 60 characters. The topic drives the rest of the newsletter. That idea is what the entire thing is designed around. We start with the copy for the subject then we work back from there”. Nicolas Straut from Fundera mentions, “To create a compelling newsletter, it’s important to maintain a regular template, colors, subject line structure, and send schedule to provide readers with a sense of regularity. The best newsletters allow readers to know what to expect and look forward to while providing interesting content that they engage with”. Nicolas continues to add, To develop great community with your email newsletter community, ask for feedback through email or social media at the end of each email, and consider sending out a simple survey twice a year to gather feedback. Some companies also create Facebook groups specifically for newsletter subscribers to share feedback, ask questions and connect with other subscribers”. There are multiple components of an email. And combining them all takes time and effort. A big part of getting people to click, however, starts with the subject line. Victor Bilandzic from Motava, explains that keeping emails short and sweet is key. He says, “Long-form emails are not read. For the various newsletters we manage, we have two approaches: 1. If the design is graphic-heavy: Only use a few lines of copy and a bold link to one external link or action we want the reader to take. 2. If the design is simple or text-only: Only a few paragraphs of copy with a plain text link at the bottom”. But the real kicker he explains, “Either way, the subject line has to be compelling so they click to view the text”. Cuuver’s James Nuttall agrees that the subject line should be enticing. Saying, “No matter how great your content is, there is no point in writing any of it if the people you send it to aren’t tempted to open the email in the first place; the best way to ensure they do this is to have a subject header which grabs their attention and makes them want to check out the contents”. He also mentions personalizing the message when possible. He explains, “Use the recipient’s name whenever possible. The personal touch works wonders at making your readers feel important and valued by your company”. Sumit Bansal from Trump Excel explains that the subject line needs to focus on the benefit of reading the email. “The first thing I do when crafting my email newsletter is a benefit-driven subject line. It’s important to make sure people are opening my emails, and the subject line is all most people see before deciding to open the email”. Sumit says “I spend 20-25% of my time on creating a good headline. Sometimes I take feedback from family/friends by sending them a test version of the newsletter”. Even though you’re likely to share a variety of interesting articles and topics in your newsletter that aren’t your own, you can share your own content too. In fact, many businesses find that summarizing their latest content is liked by their readers. Aubrey Harper from Kapost mentions that sharing a personal message from different team members works for them. She says, “We send a weekly newsletter that includes both a personal note from myself, the managing editor of the blog, along with several high-performing blogs with a connecting thread”. As mentions Project Management Trainer & Consultant Praveen Malik. Praveen explains, “The main content of the newsletter is taken from my latest blog post. The message contains a small summary and a link to the post”. Similarly, writer and blogger Rob Powell shares his recent blogs too. He says, “I send a link to my latest blog post and I let my readers know what my current focus is with regard to my blog”. It not just about sharing your written content either. You can use your newsletter as a channel for sharing what’s happening with your company too. Lisa Chu from Black n Bianco, explains that you don’t have to create a sales pitch to generate sales. But rather use a narrative to talk about things that relate to you. She says, “To create a newsletter I always try to build around a narrative that relates to our products or brand. Especially if there were any recent news”. For example, “We had a little customer who wore our suit to meet our local Los Angeles Mayor, Eric Garcetti. We used that as a narrative to share with our customers in our newsletter,” she explained. It’s easy to create a story when you use a theme as your template. Hung Nguyen from Smallpdf says “Smallpdf newsletters always start with a theme. This in itself will drive open rate, CTR and engagement, as people love participating in seasonal events”. Hung goes on to explain that after deciding on a theme it’s all about forming the content. Saying, “Then I work to draft the content of the email campaign. Afterward, I speak to developers and designers regarding assets required to create the campaign, as well as changes on our platform if the newsletter will lead users to our site to perform specific actions”. Elise Telford from Futurety mentions that “Each month, we create our newsletter (Digital Digest) to connect with our current clients, prospects, and partners to give them an inside look into what’s happening at our company, as well as shared value-added content about data analytics and marketing automation”. Megan Robinson from @revenue mentions that they use a dashboard to help track all of their content. She says, “We have a marketing dashboard that combines all of our events, blogs, topics, resources into one place. We also follow a format for recurring sections such as client spotlights”. Smoking Chili Media’s Alistair Dodds explains that a compelling newsletter is a combination of content, as well as testing. Alistair explains their process as first they, “Draft ideas with the team based on best performing content on our blog from past weeks”. Then they, “Draft ideas of best-curated content the team has read and which we feel will add the most value to our audience”. When it’s all said and done, your newsletter needs to educate without being too overwhelming. Kim Smith from Goodfirms explains that the best newsletters are well balanced. She says, “Create a balance between information and sales copy”. She further explains that “Your email newsletter ought to be majorly about giving important data. It’s alright to advertise your products or services. However, ensure not to overwhelm the content, and be careful about putting it in context”. Remember your CTA can do the talking for you, so you don’t have to waste your space on pitching your product. Instead use your newsletter as a chance to inform, educate, and bring to light important industry topics.